Not to be confused with Osteocalcin or Osteopontin. Osteonectin is a glycoprotein in the bone that binds calcium. It is secreted by osteoblasts during bone formation, initiating mineralization and promoting mineral crystal formation. Osteonectin also shows affinity for collagen in addition to bone mineral calcium. A correlation between osteonectin over-expression and ampullary cancers and chronic pancreatitis has been found. 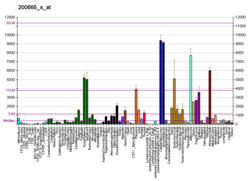 The human SPARC gene is 26.5 kb long, and contains 10 exons and 9 introns and is located on chromosome 5q31-q33. Osteonectin is a 40 kD acidic and cysteine-rich glycoprotein consisting of a single polypeptide chain that can be broken into 4 domains: 1) a Ca++ binding domain near the glutamic acid-rich region at the amino terminus (domain I), 2) a cysteine-rich domain (II), 3) a hydrophilic region (domain III), and 4) an EF hand motif at the carboxy terminus region (domain IV). Osteonectin is an acidic extracellular matrix glycoprotein that plays a vital role in bone mineralization, cell-matrix interactions, and collagen binding. Osteonectin also increases the production and activity of matrix metalloproteinases, a function important to invading cancer cells within bone. Additional functions of osteonectin beneficial to tumor cells include angiogenesis, proliferation and migration. Overexpression of osteonectin is reported in many human cancers such as breast, prostate and colon. This molecule has been implicated in several biological functions, including mineralization of bone and cartilage, inhibiting mineralization, modulation of cell proliferation, facilitation of acquisition of differentiated phenotype and promotion of cell attachment and spreading. A number of phosphoproteins and glycoproteins are found in bone. The phosphate is bound to the protein backbone through phosphorylated serine or threonine amino acid residues. The best characterized of these bone proteins is osteonectin. It binds collagen and hydroxyapatite in separate domains, is found in relatively large amounts in immature bone, and promotes mineralization of collagen. Fibroblasts, including periodontal fibroblasts, synthesize osteonectin. This protein is synthesized by macrophages at sites of wound repair and platelet degranulation, so it may play an important role in wound healing. SPARC does not support cell attachment, and like tenascin, is anti-adhesive and an inhibitor of cell spreading. It disrupts focal adhesions in fibroblasts. It also regulates the proliferation of some cells, especially endothelial cells, mediated by its ability to bind to cytokines and growth factors. Osteonectin has also been found to decrease DNA synthesis in cultured bone. High levels of immunodetectable osteonectin are found in active osteoblasts and marrow progenitor cells, odontoblasts, periodontal ligament and gingival cells, and some chondrocytes and hypertrophic chondrocytes. Osteonectin is also detectable in osteoid, bone matrix proper, and dentin. Osteonectin has been localized in a variety of tissues, but is found in greatest abundance in osseous tissue, tissues characterized by high turnover (such as intestinal epithelium), basement membranes, and certain neoplasms. Osteonectin is expressed by a wide variety of cells, including chondrocytes, fibroblasts, platelets, endothelial cells, epithelial cells, Leydig cells, Sertoli cells, luteal cells, adrenal cortical cells, and numerous neoplastic cell lines (such as SaOS-2 cells from human osteosarcoma). Model organisms have been used in the study of SPARC function. A conditional knockout mouse line, called Sparctm1a(EUCOMM)Wtsi was generated as part of the International Knockout Mouse Consortium program — a high-throughput mutagenesis project to generate and distribute animal models of disease to interested scientists. Male and female animals underwent a standardized phenotypic screen to determine the effects of deletion. Twenty six tests were carried out on mutant mice and six significant abnormalities were observed. Homozygous mutant animals had unusually white incisors, decreased bone mineral density, abnormal lens morphology, cataracts and a decreased length of long bones. ^ Villarreal XC, Mann KG, Long GL (Jul 1989). "Structure of human osteonectin based upon analysis of cDNA and genomic sequences". Biochemistry. 28 (15): 6483–91. doi:10.1021/bi00441a049. PMID 2790009. ^ Guweidhi A, Kleeff J, Adwan H, Giese NA, Wente MN, Giese T, Büchler MW, Berger MR, Friess H (Aug 2005). "Osteonectin influences growth and invasion of pancreatic cancer cells". Annals of Surgery. 242 (2): 224–34. doi:10.1097/01.sla.0000171866.45848.68. PMC 1357728. PMID 16041213. ^ Wasi S, Otsuka K, Yao KL, Tung PS, Aubin JE, Sodek J, Termine JD (Jun 1984). "An osteonectinlike protein in porcine periodontal ligament and its synthesis by periodontal ligament fibroblasts". Canadian Journal of Biochemistry and Cell Biology. 62 (6): 470–8. doi:10.1139/o84-064. PMID 6380686. ^ Young MF, Kerr JM, Ibaraki K, Heegaard AM, Robey PG (Aug 1992). "Structure, expression, and regulation of the major noncollagenous matrix proteins of bone". Clinical Orthopaedics and Related Research (281): 275–94. doi:10.1097/00003086-199208000-00042. PMID 1499220. ^ Lane TF, Sage EH (Feb 1994). "The biology of SPARC, a protein that modulates cell-matrix interactions". FASEB Journal. 8 (2): 163–73. PMID 8119487. ^ "Dysmorphology data for Sparc". Wellcome Trust Sanger Institute. ^ "DEXA data for Sparc". Wellcome Trust Sanger Institute. ^ "Radiography data for Sparc". Wellcome Trust Sanger Institute. ^ "Eye morphology data for Sparc". Wellcome Trust Sanger Institute. ^ "Salmonella infection data for Sparc". Wellcome Trust Sanger Institute. ^ "Citrobacter infection data for Sparc". Wellcome Trust Sanger Institute. Yan Q, Sage EH (Dec 1999). "SPARC, a matricellular glycoprotein with important biological functions". The Journal of Histochemistry and Cytochemistry. 47 (12): 1495–506. doi:10.1177/002215549904701201. PMID 10567433. Altura BM (Jun 1975). "Pharmacological effects of alpha-methyldopa, alpha-methylnorepinephrine, and octopamine on rat arteriolar, arterial, and terminal vascular smooth". Circulation Research. 36 (6 Suppl 1): 233–40. doi:10.1161/01.res.36.6.233. PMID 1093755. Raines EW, Lane TF, Iruela-Arispe ML, Ross R, Sage EH (Feb 1992). "The extracellular glycoprotein SPARC interacts with platelet-derived growth factor (PDGF)-AB and -BB and inhibits the binding of PDGF to its receptors". Proceedings of the National Academy of Sciences of the United States of America. 89 (4): 1281–5. doi:10.1073/pnas.89.4.1281. PMC 48433. PMID 1311092. Mundlos S, Schwahn B, Reichert T, Zabel B (Feb 1992). "Distribution of osteonectin mRNA and protein during human embryonic and fetal development". The Journal of Histochemistry and Cytochemistry. 40 (2): 283–91. doi:10.1177/40.2.1552170. PMID 1552170. Kelm RJ, Mann KG (Mar 1990). "Human platelet osteonectin: release, surface expression, and partial characterization". Blood. 75 (5): 1105–13. PMID 2306517. Young MF, Day AA, Dominquez P, McQuillan CI, Fisher LW, Termine JD (1990). "Structure and expression of osteonectin mRNA in human tissue". Connective Tissue Research. 24 (1): 17–28. doi:10.3109/03008209009152419. PMID 2338025. Metsäranta M, Young MF, Sandberg M, Termine J, Vuorio E (Sep 1989). "Localization of osteonectin expression in human fetal skeletal tissues by in situ hybridization". Calcified Tissue International. 45 (3): 146–52. doi:10.1007/BF02556057. PMID 2505905. Sage H, Vernon RB, Funk SE, Everitt EA, Angello J (Jul 1989). "SPARC, a secreted protein associated with cellular proliferation, inhibits cell spreading in vitro and exhibits Ca+2-dependent binding to the extracellular matrix". The Journal of Cell Biology. 109 (1): 341–56. doi:10.1083/jcb.109.1.341. PMC 2115491. PMID 2745554. Swaroop A, Hogan BL, Francke U (Jan 1988). "Molecular analysis of the cDNA for human SPARC/osteonectin/BM-40: sequence, expression, and localization of the gene to chromosome 5q31-q33". Genomics. 2 (1): 37–47. doi:10.1016/0888-7543(88)90107-3. PMID 2838412. Wewer UM, Albrechtsen R, Fisher LW, Young MF, Termine JD (Aug 1988). "Osteonectin/SPARC/BM-40 in human decidua and carcinoma, tissues characterized by de novo formation of basement membrane". The American Journal of Pathology. 132 (2): 345–55. PMC 1880722. PMID 3400777. Clezardin P, Malaval L, Ehrensperger AS, Delmas PD, Dechavanne M, McGregor JL (Aug 1988). "Complex formation of human thrombospondin with osteonectin". European Journal of Biochemistry / FEBS. 175 (2): 275–84. doi:10.1111/j.1432-1033.1988.tb14194.x. PMID 3402455. Lankat-Buttgereit B, Mann K, Deutzmann R, Timpl R, Krieg T (Aug 1988). "Cloning and complete amino acid sequences of human and murine basement membrane protein BM-40 (SPARC, osteonectin)". FEBS Letters. 236 (2): 352–6. doi:10.1016/0014-5793(88)80054-1. PMID 3410046. Stenner DD, Tracy RP, Riggs BL, Mann KG (Sep 1986). "Human platelets contain and secrete osteonectin, a major protein of mineralized bone". Proceedings of the National Academy of Sciences of the United States of America. 83 (18): 6892–6. doi:10.1073/pnas.83.18.6892. PMC 386616. PMID 3489235. Jundt G, Berghäuser KH, Termine JD, Schulz A (May 1987). "Osteonectin--a differentiation marker of bone cells". Cell and Tissue Research. 248 (2): 409–15. doi:10.1007/bf00218209. PMID 3581152. Fisher LW, Hawkins GR, Tuross N, Termine JD (Jul 1987). "Purification and partial characterization of small proteoglycans I and II, bone sialoproteins I and II, and osteonectin from the mineral compartment of developing human bone". The Journal of Biological Chemistry. 262 (20): 9702–8. PMID 3597437. Sage H, Johnson C, Bornstein P (Mar 1984). "Characterization of a novel serum albumin-binding glycoprotein secreted by endothelial cells in culture". The Journal of Biological Chemistry. 259 (6): 3993–4007. PMID 6368555. Termine JD, Kleinman HK, Whitson SW, Conn KM, McGarvey ML, Martin GR (Oct 1981). "Osteonectin, a bone-specific protein linking mineral to collagen". Cell. 26 (1 Pt 1): 99–105. doi:10.1016/0092-8674(81)90037-4. PMID 7034958. Xie RL, Long GL (Sep 1995). "Role of N-linked glycosylation in human osteonectin. Effect of carbohydrate removal by N-glycanase and site-directed mutagenesis on structure and binding of type V collagen". The Journal of Biological Chemistry. 270 (39): 23212–7. doi:10.1074/jbc.270.39.23212. PMID 7559469. Maurer P, Hohenadl C, Hohenester E, Göhring W, Timpl R, Engel J (Oct 1995). "The C-terminal portion of BM-40 (SPARC/osteonectin) is an autonomously folding and crystallisable domain that binds calcium and collagen IV". Journal of Molecular Biology. 253 (2): 347–57. doi:10.1006/jmbi.1995.0557. PMID 7563094.